Genome-wise association studies (GWAS) identify risk variants and modifiers that can influence the pathophysiological processes involved in colorectal cancer (CRC) and thus are important to detect associations between disease phenotypes. Our literature review, performed as per PRISMA statement indicates a significant lack of GWAS functional studies in Saudi Arabia. Therefore, studies on sequencing and mapping are needed to identify gene variants that play a role in the pathophysiology of CRC in this specific population. Because it is not apt to generalize disease associations found in other racial and/or ethnic groups to the Arabic or Middle Eastern population, it is very important to conduct GWAS taking into account multiple ethnicities in this region. In addition, linkage studies and case-control studies that include the various confounding and epigenetic factors are needed for appropriate diagnosis of CRC. We recommend that studies in this region be conducted to understand the role of gene-environment interactions across the various ethnic groups, stages of cancer, tumor type, clinical variables, and the population risk to CRC. Extrahepatic portal vein obstruction is a vascular disorder of liver, which results in obstruction and cavernomatous transformation of portal vein with or without the involvement of intrahepatic portal vein, splenic vein, or superior mesenteric vein. Portal vein obstruction due to chronic liver disease, neoplasm, or postsurgery is a separate entity and is not the same as extrahepatic portal vein obstruction. Patients with extrahepatic portal vein obstruction are generally young and belong mostly to Asian countries. It is therefore very important to define portal vein thrombosis as acute or chronic from management point of view. Portal vein thrombosis in certain situations such as liver transplant and postsurgical/liver transplant period is an evolving area and needs extensive research. There is a need for a new classification, which includes all areas of the entity. 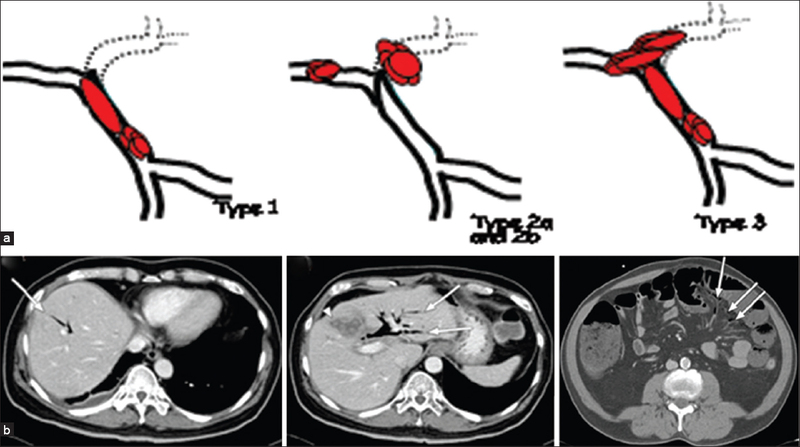 In the current review, the most recent literature of extrahepatic portal vein obstruction is reviewed and summarized. Background/Aims: Fetuin-A, a glycoprotein with anti-inflammatory properties, plays an important role in counter-regulating inflammatory responses. It has also been associated with insulin resistance and metabolic syndrome. We aimed to investigate circulating concentrations of fetuin-A and its possible association with hepatic and systemic inflammation in nondiabetic subjects with nonalcoholic fatty liver disease (NAFLD). Patients and Methods: We included 105 nondiabetic male subjects with NAFLD [nonalcoholic steatohepatitis (NASH, n = 86) and simple steatosis (SS, n = 19)]. 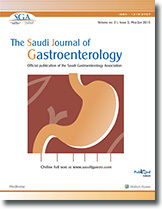 Plasma levels of fetuin-A and markers of inflammation [high-sensitive C reactive protein (hsCRP), tumor necrosis factor alpha (TNF-α), interleukin-6 (IL-6), and adiponectin] were measured by enzyme-linked immunosorbent assay method. Insulin sensitivity was determined by homeostasis model assessment of insulin resistance (HOMA-IR) index. Results: Fetuin-A was negatively correlated with age (r = −0.27, P = 0.006), however there was no association between fetuin-A and body mass index, waist circumference (WC), glucose, insulin, HOMA-IR, lipid parameters, and inflammatory markers. In addition, no significant association was observed between fetuin-A and histological findings including liver fibrosis. Conclusion: This study demonstrated that plasma fetuin-A levels are not correlated with the hepatic histology and systemic markers of inflammation in nondiabetic subjects with NAFLD. Our data also suggested that age is significantly associated with fetuin-A in this clinically relevant condition. Background/Aims: This study aimed to evaluate the antiviral response and safety of tenofovir (TDF) versus entecavir (ETV) in treatment-naïve CHB patients. Patients and Methods: We performed a retrospective cohort study of treatment-naive CHB patients who were treated with TDF or ETV. We analyzed virologic, biochemical, and serologic responses at 3, 6, and 12 months. Results: A total of 107 patients (TDF group = 49, ETV group = 58) were included. Baseline characteristics were similar between the two groups. The estimated proportion of complete virologic response (CVR) in the TDF or ETV group was 44.9% versus 39.7% at 6 months and 89.6% versus 83.2% at 12 months, respectively (P = 0.991). Viral breakthrough was not observed in both groups. 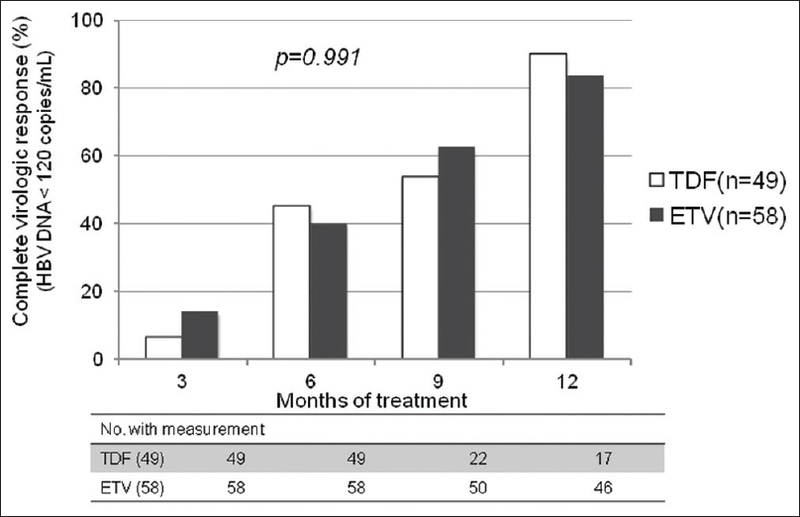 One patient in the TDF group and two patients in the ETV group experienced HBeAg loss, respectively (P = 0.657). High HBV DNA level at baseline was a significant negative predictor of virologic response by Cox regression analysis (P = 0.007). The safety profile was similar between the two groups. There was no case with serious adverse event. Conclusions: Both TDF and ETV were effective in achieving CVR and had a favorable safety profile in treatment-naïve CHB patients. High viral load at baseline was a negative predictive factor of CVR. Background/Aims: High-resolution manometry (HRM) has improved the accuracy of manometry in detecting achalasia and determining its subtypes. However, the correlation of achalasia subtypes with clinical, endoscopic, and radiologic findings has not been assessed. We aimed to evaluate and compare the clinical, endoscopic, and fluoroscopy findings associated with three subtypes of achalasia using HRM. Patients and Methods: The retrospective clinical data, HRM, endoscopy, and radiologic findings were obtained from the medical records of untreated achalasia patients. Results: From 2011 to 2013, 374 patients underwent HRM. Fifty-two patients (14%) were diagnosed with achalasia, but only 32 (8.5%) of these patients had not received treatment and were therefore included in this study. The endoscopy results were normal in 28% of the patients, and a barium swallow was inconclusive in 31% of the achalasia patients. Ten patients (31%) were classified as having type I achalasia, 17 (53%) were classified as type II, and 5 (16%) were classified as type III. 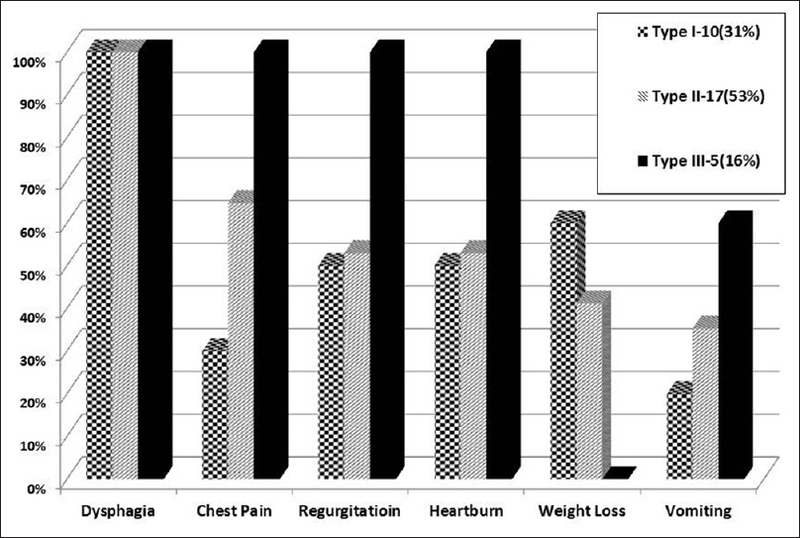 Among the three subtypes, type I patients were on average the youngest and had the longest history of dysphagia, mildest chest pain, most significant weight loss, and most dilated esophagus with residual food. Chest pain was most common in type III patients, and frequently had normal fluoroscopic and endoscopic results. Conclusion: The clinical, radiologic, and endoscopic findings were not significantly different between patients with type I and type II untreated achalasia. Type III patients had the most severe symptoms and were the most difficult to diagnose based on varied clinical, radiologic, and endoscopic findings. Background/Aims: Nonalchoholic fatty liver disease (NAFLD) has been reported as a hepatic manifestation of metabolic syndrome (MetS); it is common and accounts for 80% of the cases with abnormal liver function tests (LFTs). In addition, several studies have proved that there is a correlation between abnormal LFTs and MetS. Therefore, LFTs may represent the abnormal metabolic status of livers in the patients with MetS. To identify the early state of metabolic dysfunction, we investigate the value of LFTs for the future MetS development in the relatively healthy (non-NAFLD) elderly. Patients and Methods: A total of 16,912 subjects met the criteria for analysis. In the first stage of this study, subjects were enrolled in the cross-sectional study in order to find out the optimal cutoff value in different LFTs with higher chances to have MetS. In the second stage of the present study, subjects with MetS at baseline were excluded from the same study group, and a median 5.6-year longitudinal study was conducted on the rest of the group. 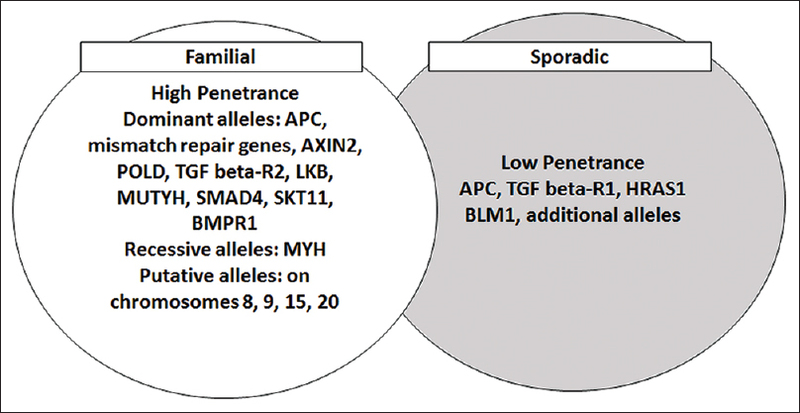 Results: Among all LFTs, only aspartate aminotransferase in both genders and the α-fetal protein in women failed to show the significance in distinguishing subjects with MetS by the receiver operating characteristic curve. In the Kaplan-Meier plot, only γ-glutamyl transpeptidase (γ-GT) in men and the alanine aminotransferase (ALT) in women could be used to successfully separate subjects with higher risk of developing the MetS from those with lower risk. Finally, in the multivariant Cox regression model, similar results were identified. Still, the hazard ratio (HR) to have future MetS, γ-GT in men, and ALT in women showed significance (HR = 1.511 in men and 1.504 in women). 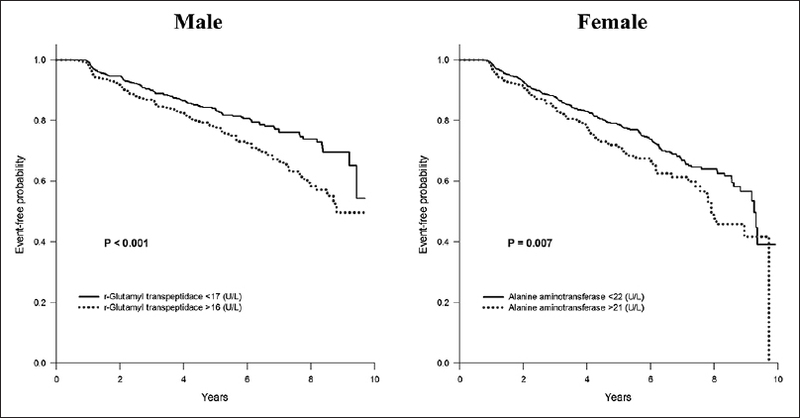 Conclusion: Among all the different LFTs, γ-GT (>16 U/L) in male and ALT (>21 U/L) in female were the best predictors for the development of MetS in healthy elderly. These two liver markers could be an ancillary test in predicting future MetS development/diagnosis. Elevation of the LFTs without underlying liver diseases should be treated as a warning sign of the possible MetS development in the elderly. 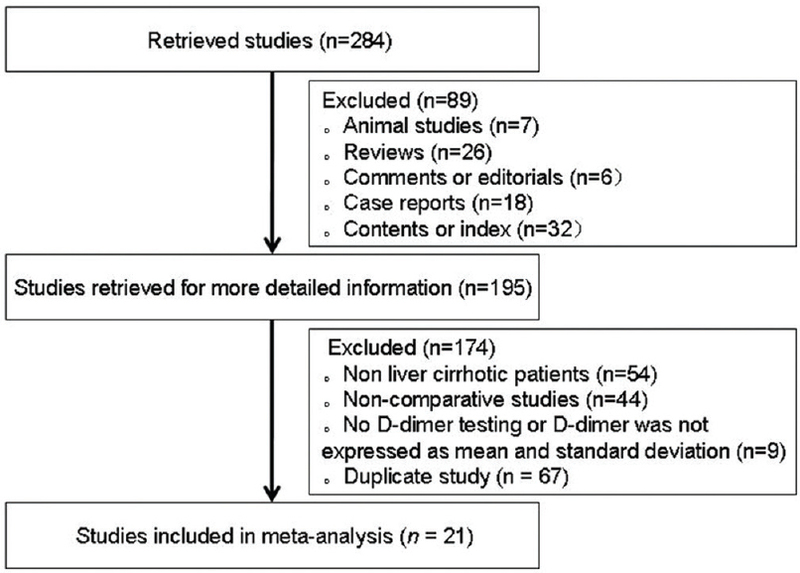 Background and Aims: A meta-analysis was performed to explore the role of the D-dimer in the development of portal vein thrombosis (PVT) in liver cirrhosis. Methods: All papers were searched via PubMed, EMBASE, China National Knowledge Infrastructure, Wan Fang, and VIP databases. A standardized mean difference (SMD) with 95% confidence interval (CI) was pooled. Results: Overall, 284 studies were initially identified, of which 21 were included. Cirrhotic patients with PVT had a significantly higher D-dimer concentration than those without PVT (pooled SMD = 1.249, 95%CI = 0.740-1.758). After the portal hypertension-related surgery, cirrhotic patients with PVT had a similar preoperative D-dimer concentration to those without PVT (pooled SMD = 0.820, 95%CI = −0.122-0.286), but a higher postoperative value of D-dimer concentration than those without PVT (pooled SMD = 2.505, 95%CI = 0.975-4.036). Notably, the D-dimer concentration at the 1 st postoperative day was similar between cirrhotic patients with and without PVT (pooled SMD = 0.137, 95%CI = −0.827-1.101), but that at the 7 th post-operative day was higher in cirrhotic patients with PVT than in those without PVT (pooled SMD = 1.224, 95%CI = 0.277-2.171). Conclusion: D-dimer might be regarded as a diagnostic marker for PVT in liver cirrhosis. In addition, postoperative D-dimer testing is worthwhile for the diagnosis of PVT after portal hypertension-related surgery. Background/Aims: To compare the efficacy and safety profile of doxorubicin-loaded drug-eluting beads (DEB) to the conventional TACE (C-TACE) in the management of nonresectable hepatocellular carcinoma (HCC). Patients and Methods: All patients with nonresectable HCC who underwent either c-TACE or DEB-TACE during the period 2006–2014 and fulfilled the inclusion criteria were included in this retrospective study. Primary endpoints were tumor response rate at first imaging follow up, treatment-related liver toxicity, and treatment emergent adverse events (TEAE). Results: Thirty-five patients (51 procedures) in the DEB-TACE group and 19 patients (25 procedures) in the c-TACE group were included in the analysis. The median follow up time was 61 days (range 24– 538 days) in the DEB-TACE group and 86 days (range 3– 152 days) for the c-TACE group patients. Complete response (CR), objective response (OR), disease control (DC), and progressive disease (PD) rates were 11%, 24%, 17%, and 47%, respectively, in the DEB = TACE group compared with 4%, 32%, 28%, and 36%, respectively, in the c-TACE group. Mean ALT change from baseline was minimal in the DEB-TACE patients compared with c-TACE group (7.2 vs 79.4 units, P = 0.001). Hospital stay was significantly shorter in the DEB-TACE group (7.8 days vs 11.4 days; P = 0.038). The 2-year survival rate was 60% for the c-TACE patients and 58% for the DEB-TACE (P = 0.4). Conclusions: DEB-TACE compared with c-TACE is associated with lesser liver toxicity benefit, better tolerance, and shorter hospital stay. The two modalities however had similar survival and efficacy benefits.